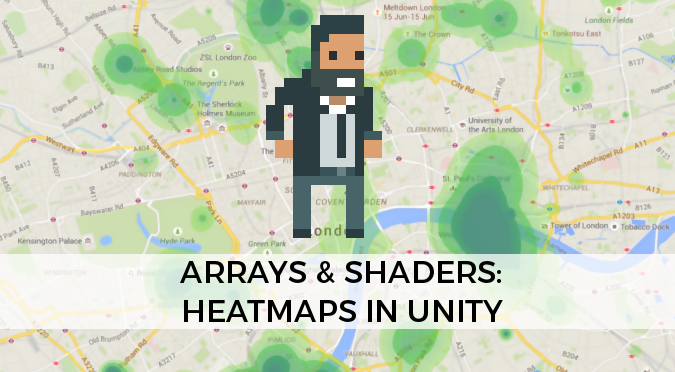 This tutorial explains how to pass arrays to shaders in Unity. This feature has been present for a long time, but is mostly undocumented. Unity 5.4.0 Beta 1 will introduce a proper API to pass arrays to shaders; this technique however will work with any previous version. If you are using Unity 5.4+, please refer to the Arrays & Shaders in Unity 5.4+ tutorial. One of the characteristic which makes shaders hard to master is the lack of a proper documentation. Most developers learn shaders by messing up with the code, without having a deep knowledge of what’s going on. The problem is amplified by the fact that Cg / HLSL makes lot of assumptions, some of which are not properly advertised. Unity3D allows C# scripts to communicate to shaders using methods such as SetFloat, SetInt, SetVector and so on. Unfortunately, Unity3D doesn’t have a SetArray property method, which led many developers to believe Cg / HLSL doesn’t support arrays either. Which is not true. This post will show how is possible to pass arrays to shaders. Just remember that GPUs are highly optimised for parallel computations, and that using for loops within a shader will dramatically drops its performance. Cg / HLSL doesn’t support arrays with variable size, so they need to be initialised with the maximum number of points (100, in this example). We also have to signal to the shader that these variables will be modified from outside, hence the uniform qualifier. As it happens in C, there is an extra variable which indicates how many points are actually used. It’s possible to notice that instead of having three variables per each point, we only have two. This is due to a nasty bug feature of Cg which doesn’t allow arrays such as float _Intensities  to be accessed from outside the shader. All the arrays we want to access from C# must be packed arrays, such as float2, float3, and so on. For this reason, the radius and intensity of points will be packed, respectively, in the x and y fields of _Properties. The variables _Points and _Properties are actual arrays, so their elements can be accessed simply using the square bracket notation. For every pixel of the geometry, lines 41-47 calculate the heat contribution given from each point. The final heat, h, (ranging from 0 to 1) is then used to sample a texture which will determine the actual colour and opacity. Lines 6-7 are necessary if we want the geometry to support alpha transparency. All the public fields can be initialised directly from the inspector. 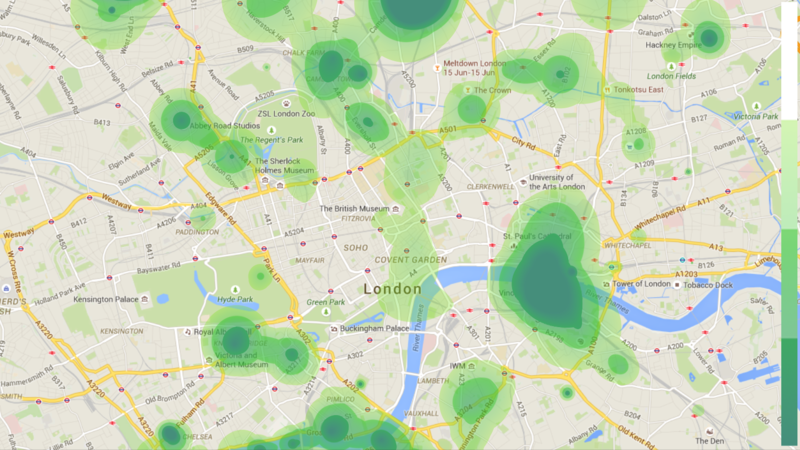 The overall look of the heatmap can change dramatically just by playing a little bit with its heat texture. Using toom ramps generally yields visually pleasant results. To overcome the huge limitation Unity3D has when it comes to pass arrays to shaders, we can create a more general class. // Requires an array called "[name]"
// and another one called "[name]_Length"
In order to work, it needs a material with a shader which contains an array. Its name must be specified in the string name. The shader must also have a variable with the same name of the array, followed by _Length. Using arrays in Shader is possible with any recent version of Unity, due to a poorly documented feature. Official APIs are planned from Unity 5.4.0 Beta 1. The technique introduced in this tutorial is compatible with earlier versions. Arrays can be used for a variety of reasons. They can be used to initiate hundreds of properties via scripting, without the need to expose each one of them individually. You can download the complete Unity package for this project here. A new tutorial is released every week. This websites exists thanks to the contribution of patrons on Patreon. If you think these posts have either helped or inspired you, please consider supporting this blog. Thanks for your amazing articles! > Just remember that GPUs are highly optimised for parallel computations, and that using for loops within a shader will dramatically drops its performance. Does this still hold true if we’re replacing 100 instanced shaders with one shader using an array of 100 points as in your example? Quick question: I’ve noticed in a few tutorials that you make use of the Hidden/SHADER_NAME naming feature, but don’t understand how you are applying these shaders to materials. Would you mind enlightening me? Thanks! Hey! I use that for a couple of reasons. First of all, I don’t want the list of my shaders to be too long. The second (and more important) reason is that some shaders are designed for a specific use or effect only. Hence, they should not be used elsewhere. 2) out of curiosity, how many ms does this image effect shader takes to run in your machine (excluding, of course, the Camera.AAResolve command), according to your profile? And in which screen resolution? Thanks! Invalid const register num: 201. Max allowed is 31. I’ve pinned it down to the for loop, most likely, however I’m still pretty novice when it comes to programming shaders. Googling suggests that this error is a response from too many constances being declared, though the code doesn’t outright seem to declare any? Anyways, do you think, is there possibly a way around this? This version doesn’t work on the 5.4 version, any update? Hey Alan, thank you very much for this great tutorial! I was wondering, would it be possible to use lists instead of an array to determine the number of points of the shader. Hey! Shaders are written in Cg, which unfortunately is not as permissive as C#. It’s possible to draw the points in black ? Yes, you can either do it via code, or using a different ramp texture. Hey! This Shader was designed for Unity. However, Unity 5 has changed the way arrays work in shader. I will post an update soon. But it still be work on Unity only. I have not tried it yet in WebGL. It might work, as soon as I make the necessary changes for Unity 5. Thanks for the updated post for 5.4. I’m missing something regarding the position part of the shader. In your heatmap example, if I move the quad which has the heatmap, the heatmap seems to be in world space, not staying on top of the quad but stays in same position as I move the quad. Yes, this was the intended behaviour. I am passing the world position of the points to the shader! If you want something different, then you’ll have to add (or subtract?!) the position of the quad from the points’ position! Can you please point me to such subject? I have a 3d object I want to draw a heatmap onto, I have the coordinates of the 3d mesh (in local space and not world space). and I want the material / shader to work wherever I place the 3d object. Then, sum (or subtract, depending on the code) this value from the position of the 3D points of the heatmap. You can also do this directly in the C# code, if you don’t want to pass an extra parameter to the shader. This is such a great tutorial but we are struggling with the same problem as bergos.. do the modifications have to happen in the vert function? And if so, to o.pos or after it has been converted to worldPos? Any help would be much appreciated! Figured it out working off of Alan’s recommendation! Now that I have the heatmap moving with the quad.transform.xyz I was curious if you had any thoughts on how to add to the solution to ensure that the heat map follows the quad after a rotation is applied. My use case would be… rotating the Quad about Y as to emulate the Quad spinning like a record player. I have managed to spin the heatmap but it breaks the logic in the frag() function..
3. And return this as a fixed4 from the frag() function instead of the color. I can’t figure out how to keep your additional return from the frag() while updating the output.uvs…any thoughts or wisdom for this shader noob would be much appreciated! Great article! This is the only document i can find about using array in shaders. I have a question as a beginner: Is “for loop” only supported in vertex shader, not in fragment shader? I’ve written a fragment shader to show heat map, it works well without loop, but failed with loop. Hey! I don’t think there’s any issue with for loops in the fragment function! I have used them for volumetric shaders, if I remember correctly. There are some limitations through. Like texture sampling in for loops. is this an efficient method? I think looping through an array of 100 elements each foreach pixel is a bit heavy. Am i underestimating the gpu power here? is this also recommended on mobile devices? The problem is not really about efficiency; is about alternatives. Is there another way to do it that is not as expensive? Sometimes there is, but for certain operations that is unlikely. Hello I am working on Fove (Eye tracking) HMD and I want to generate headmap using your technique. I have passed the rays from an eye to the shader as position but the problem is every time i do it. I dont really get anything. If you could please assist me this. I would really appreciate it. Hi! The current API that Unity provides doesn’t allow for multidimensional array. This is something you might have to write yourself manually I’m afraid! If the array you want to pass never changes, you could also encode it in a texture (for 2D array) or in a texture3D (for 3D array)! I have created the material and than I associated the shader to the material. What should be the object in the hierarchy should have the material I created ? Why in the shader Points_Lenght is 0 and _Points and Properties containe 20 elements ? I think they should contain 100 elements like the array in the c# code. Hi Alan, I downloaded the complete unity package and I tried it with my Unity 2018.2.1f1 but it doesn’t work. Do you have any idea ? How would I go about scaling the size up for this shader? I need it for a map about 15000×15000 in size. When I scale the quad the heatmap.cs is attached to the shader does not scale up. So when looking at my large map you can only see what looks like a pin prick in the center to represent the shader. Can you help? When tried this shader in android it throws ——– GLSL link error: Error: Uniform _Points cannot find a suitable location/component. I have just updated the tutorial, but haven’t updated the ino file yet. So if you’re using the original one, it still miss the new include directive. It seems that Unity 5.4 added array support for shaders. Hello! Tried to make you solution work with Unity 5.4 but failed. Thanks for idea! Thanks for respond. Yes, I read new tutorial but still failed. Mind to share you solution updated to 5.4? Thanks. Sorry but after tested on unity 5.4 the new tutorial, nothing appear on map. Any chance to make a working example ? maybe for update unity version too ? Did you implement the function in Awake to initialise the array to its full size at the start of the scene?